The Earth's ozone layer protects all life from the sun's harmful ultraviolet radiation (UVB), but human activities have damaged this shield. Less protection from ultraviolet light will, over time, lead to higher skin cancer and cataract rates and crop damage. The Earth's atmosphere is divided into several layers. The lowest region, the troposphere, extends from the Earth's surface up to about 10 kilometers (km) in altitude. Virtually all human activities occur in the troposphere. Mt. Everest, the tallest mountain on the planet, is only about 9 km high. The next layer, the stratosphere, continues from 10 km to about 50 km. Most atmospheric ozone is concentrated in a layer in the stratosphere, about 15-30 kilometers above the Earth's surface. 'Normal' oxygen, which we breathe, has two oxygen atoms, double covalently bonded together and is colourless and odourless. It has the formula O2. Ozone is a molecule containing three oxygen atoms bonded together and thus has the formula O3. The name ozone is derived from a Greek word meaning "to smell". It is blue in colour and has a strong odour (a bit like seaweed - because of that the Victorians thought that there were high ozone levels at the sea-side and it was good for you! In fact that is not the case and it causes breathing difficulties for people when it is found in the lower atmosphere). At ground level, ozone is a serious health hazard it is a harmful pollutant that causes damage to lung tissue and plants- it is a major constituent of smog. 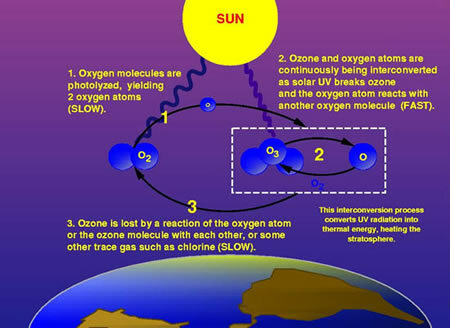 Ozone is much less common than the double oxygen molecule. Out of each 10 million air molecules, about 2 million are the common oxygen molecule, but only three are ozone. Ozone is constantly produced and destroyed in a natural cycle. The overall amount of ozone was essentially stable until relatively recently. There was said to be an equilibrium because ozone production and destruction are balanced keeping the ozone levels stable. When the pole is tilted away from the sun - for example the North Pole in December there is less solar activity and the process is halted for a while. Whe the pole is tilted towards the sun - for example the North Pole in June there is a lot of solar radiation hitting the tmosphere and the process happens more readily. This was the situation until the past several decades when our production of certain chemicals (mainly chemicals used in the cooling systems in refrigerators and as propellants in aerosol cannisters - CFCs) upset that balance and shifted the equilibrium so that the ozone layer that protects the Earth from harmful ultraviolet light became thinner - effectively creating a 'hole' over the poles. This did NOT happen because of increased carbon dioxide - it has nothing to do with Global Warming! Talking of Global Warming in an examination question about Ozone Depletion can lose you all of the marks! It is the large increases in stratospheric chlorine and bromine that has upset the Earth's ozone cycle equilibrium by removing ozone faster than natural ozone creation reactions can work at. Therefore, ozone levels fell dramatically. Over the past couple of decades we have worked hard to stop these chemicals from entering the atmosphere and ozone depletion is less of a problem, but the ozone layer is still thinner than it used to be and will take a long time to recover from the damage we have done to it. In the autumn of 2006 the hole in the ozone layer was the largest it has ever been at 29.6 million square miles, larger than Antarctica itself! This was due to a number of factors, natural conditions as well as man-made. However since that time ozone levels have remained static and although the hole has not yet started to decrease in size, most scientists agree that the ozone layer will recover, but signs of recovery will not be seen until 2020 at the earliest, and full recovery will not take place until at least 2049 over middle latitudes and not until 2065 over Antarctica. 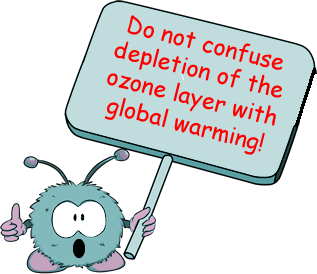 Why is a 'hole in the ozone layer' a problem? Since ozone filters out harmful UVB radiation, less ozone means higher UVB levels at the Earth's surface. The more depletion, the larger the increase in incoming UVB. UVB has been linked to skin cancer, cataracts, damage to materials like plastics, and harm to certain crops and marine organisms. Although some UVB reaches the surface even without ozone depletion, its harmful effects will increase as a result of this problem. The ozone depletion process begins when CFCs and other ozone-depleting substances (ODS) are emitted into the atmosphere. Winds efficiently mix the troposphere and evenly distribute the gases. CFCs are extremely stable, and they do not dissolve in rain. After a period of several years, ODS molecules reach the stratosphere, about 10 kilometers above the Earth's surface . Strong UV light breaks apart the ODS molecule. CFCs, HCFCs, carbon tetrachloride, methyl chloroform, and other gases release chlorine atoms, and halons and methyl bromide release bromine atoms . It is these atoms that actually destroy ozone, not the intact ODS molecule. It is estimated that one chlorine atom can destroy over 100,000 ozone molecules before it is finally being removed from the stratosphere!! Mouse over the graphic on the right of the screen for an animation of how a CFC breaks down ozone. The information and graphics on this page were taken from http://www.epa.gov with kind permission.